"The City of Groveland welcomes Kroger and Ocado," said Mayor Evelyn Wilson. "We see it as another component to our overall community development and it demonstrates the City’s commitment to foster quality jobs and provide exceptional livability." Anointed Community Services held their annual Back to School Bash at the Else Tomlin Center on July 28th. School supplies were handed out, hot dogs were served, and Police and Fire were on hand. 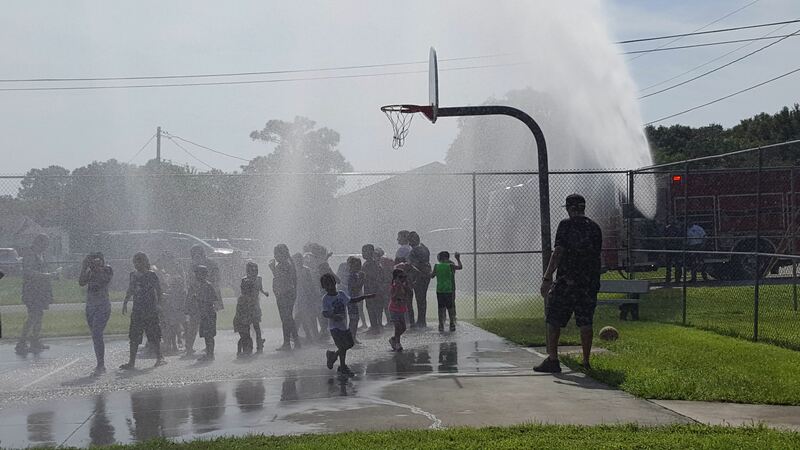 The Fire Department proved to the Police Department that they are the coolest Public Safety Department, by turning the basketball court into a splash pad! Kids and adults alike enjoyed the respite from the heat! New playground equipment has been purchased for David Blanks Playground. The equipment will be installed in early November. New playground equipment has been purchased for Lake David Park. The equipment will be installed in mid-November. The project was approved for construction in February. Hartman Civil Construction was awarded the contract in March. The project involved replacing old asbestos cement and galvanized pipe water mains with new PVC and Polyethylene pipes. More than 4,700 feet of water mains were replaced on Iowa Avenue, Waldo Street, Warner Street and Swanson Street. In addition to the water mains, six old fire hydrants were replaced and six more were installed at strategic locations around the community.